Your pose for today is: Savasana! 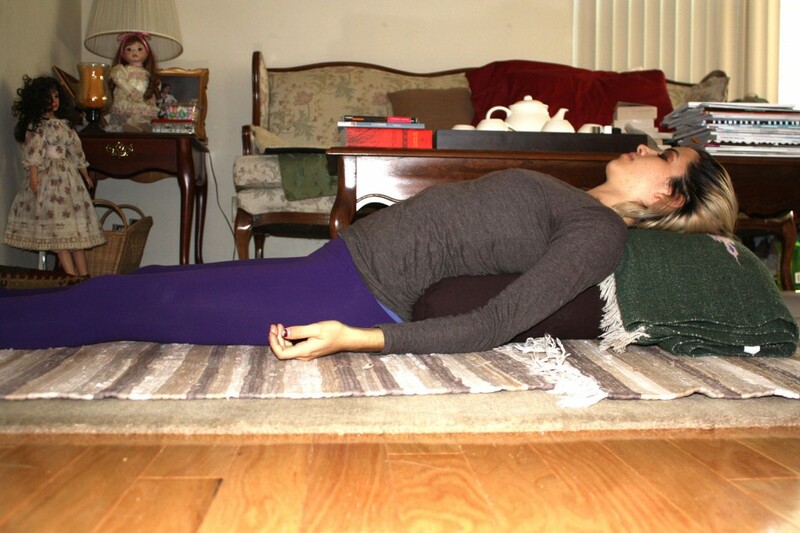 Savasana (or corpse pose) can be practiced many different ways. Practicing Savasana will help you keep calm throughout the day, be able to positively respond to stress, and teach your body to relax in preparation for a deep sleep. This article will not only teach you how to practice Savasana for the times when you cannot lie still, but the different variations of Savasana and how to add elements such music, breath, and visualization!! Traditionally, Savasana is practiced lying on your back, legs extended and arms by your sides with palms facing up. However, when we’re anxious, panicky, or depressed, we often can’t relax our muscles when we are lying down. We’ve all had those nights when sleeping is IMPOSSIBLE because our mind is racing with stressful thoughts that keep us awake, and perhaps, leave us crying or panicking throughout the night. Savasana is considered the most DIFFICULT pose in a yoga practice because it is hard to stop the mind from racing and be engaged in total relaxation. Every yoga class works up to Savasana. It takes practice to train your mind and body to be fully relaxed when lying down! So it’s okay and normal if you can’t practice Savasana today, or if you can’t stay still for very long. Practice Half Sun Salutation or Sun Salutation A 3-5 times, and hold the last Forward Fold for 3-5 breaths. Learn how to practice Half Sun Sal here, and Full Sun Sal here. Then, choose a variation of Savasana to practice. Practice Half Sun Sal 3-5 times and hold the last Downward Facing Dog for 3-5 breaths. End standing in “Tadasana” (AKA standing up) and set your intention for the rest of your day or night. Learn how to practice Half Sun Sal here, and Downward Facing Dog here. Then choose a variation of Savasana to practice. Practice Sun Salutation A 3-5 times, but slow down the last Sun Salutation. Let your breath deepen, and focus on flowing through the poses without any pauses. Hold the last Downward Facing Dog for 3-5 breaths. End in “Tadasana” (standing up) and set your intention for the rest of the day or night. Then choose a variation of Savasana to practice. If you feel ready to try Savasana, below are variations! **My eyes are closed here, but I recommend keeping your eyes open** Legs up the wall is amazing if you stand for many hours a day. This pose helps with circulation, and is considered an “Inversion.” Inversions help to alter your mood! If legs up the wall is too much, you can try it with a chair – bend your knees, and let your calves melt into the seat of the chair. You can also take your legs out to the sides for Side Splits. It’s nice on the hips/hip flexors. Breathe into the hips, and exhale down the legs, out the toes. **My eyes are closed here, but I recommend keeping your eyes open** In a yoga studio, you would use a bolster, and fold a blanket for this pose. But, if you don’t have a bolster and blanket accessible, you can use stacked pillows or stiff/thick blankets that are about 6 inches tall when laid on, and add a folded towel or small pillow under your head. This pose adds breath into the body. Eyes Open or Eyes Closed??? Try practicing Savasana with your eyes open first! If it feels okay in the mind, you can close eyes, but if a bad feeling pops up with the eyes closed, don’t worry, this is normal. Reopen your eyes, and return to concentrating on your breath. It is so easy for the mind to wander into a blackhole of swirling negative thoughts! So, if you find your the mind thinking of these negative thoughts, try to concentrate on something such as music, the Ujayi breath, or visualization. When the right music is chosen, music will help distract the mind and take you into another world. Pick music that is calming, but that does not make you sad. Music that will prep you for the best sleep you will ever have! While in your choice of Savasana, listen to your favorite calming music, and practice the Ujjayi breathing. If this isn’t enough, there is one more element that you can add to your tool box for total relaxation – visualization. Visualization gives your mind and body another thing to do besides just focusing on inhaling and exhaling (which sometimes can be aggravating because it’s not enough to busy the mind.) Below are visualization options that can be catered to your mood. Still using Ujjayi breath, take a very, very slow inhale into the belly. Hold your breath at the top of your inhalation for 3 counts. Exhale, release the breath. Keep increasing the length of your inhales. As you inhale, visualize your breath going through your body, and trickling down the spine, down the legs, and out the toes, then, exhale. Still using Ujjayi breath, inhale into the belly. Hold your breath at the top of your inhalation. Exhale very, very, slowly for about 5-10 counts. Keep increasing the length of your exhales. Visualize your breath going up the body on your inhales, and trickling down the spine, down the legs, and out the toes on your exhales. You can try the same technique as someone who is depressed and fatigued, or, you can try a visualization for muscle tension. Notice how your breath feels. And start to visualize what the breath looks like. Give the breath a cooling or warming color – perhaps light blue, or light yellow. With every inhale, imagine a hand is coming into your body, and picking up the spot of tension, with every exhale imagine your breath helping the hand to remove the tension from your body. Repeat this in all areas of your body that is tense. Melt. Release. Become heavy. Relax into the earth. 1. Smelly Room means Smelly Mood !! Make the space where you practice smell good! Lavender is often very calming. Whole Foods has lavender oil you can put on your hands and neck, or lavender spray to spray around your room. A nice smelling candle is also helpful and usually sets the mood for me to melt and relax. It’s very hard to relax when you feel like an ice cube or when you’re being burned in an oven, so make sure to adjust your clothing and fans/heaters to keep you comfortable. During the winter, I love wearing a hoodie, fuzzy socks, and these crazy Peruvian pants my aunt brought me from Cusco. How Long Do I Stay in Savasana??? Savasana is definitely something I practice everyday in many different ways. My muscles love to tense up when I am anxious, and it’s an awful domino effect of unfortunate events that follow my muscle tension. My shoulders turn inward, upper back hunches, breathing quickens, and I can’t talk to anyone. Wherever I am, I want to immediately RUN. Ujjayi Breath and visualization during these times helps me the most; they help me stay grounded and focused on what’s actually happening instead of letting my body freak out in it’s own dark universe. Throughout the day, I take 10 minute intervals to tune into my muscle tension, and breathe into the spots that are tense to relax. I also carry around Peppermint Oil to cool my hip flexors and neck when they need a little extra help relaxing. At night, it really depends on my mood and on my bodily aches for what type of Savasana I practice. But man, if I didn’t do all this work, I’d still be drinking and smoking every night. It took a lot of dedication and practice to be able to choose 10 minutes of meditative visualization, breath, and yoga over destructive methods. I’m not saying “I’m perfect,” but the last time I smoked or drank out of fear or sadness was when I returned to school. I try to remember that drinking should be a luxury for happy celebrations, and not as a coping mechanism. Savasana is hard, but it’s worth the practice. I feel so much better today than I’ve ever felt…ever.